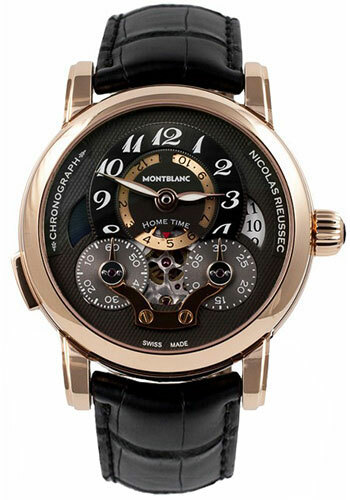 43mm 18K red gold case, screwed sapphire crystal back, domed sapphire crystal with double anti-reflective coating, anthracite dial with grain d'orge guilloché pattern and white numerals, luminescent feuille hour and minute hands, automatic winding monopusher chronograph Montblanc MB R210 movement with hours and minutes on off-center dial, second time zone by rotating disc, day/night display for second time zone at 9 o'clock, date display at 3 o'clock, travel function with fast forward and backward resetting of hour hand and date, chronograph with motionless hands and rotating discs for 60 seconds and 30 minutes, approximately 72 hours of power reserve, black alligator strap with 18K red gold double-folding buckle. Water resistant to 3 bar (30 m). 43mm stainless steel case, screwed sapphire crystal back, domed sapphire crystal with double anti-reflective coating, silver dial with grain d'orge guilloché pattern and black numerals, luminescent feuille hour and minute hands, automatic winding monopusher chronograph Montblanc MB R210 movement with hours and minutes on off-center dial, second time zone by rotating disc, day/night display for second time zone at 9 o'clock, date display at 3 o'clock, travel function with fast forward and backward resetting of hour hand and date, chronograph with motionless hands and rotating discs for 60 seconds and 30 minutes, approximately 72 hours of power reserve, stainless steel bracelet. Water resistant to 3 bar (30 m).